Two stations are being proposed for Shoreline, including one at N 185th Street on the east side of I-5. ﻿﻿opportunity ﻿to﻿ help plan﻿ ﻿for it. 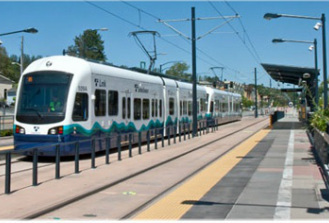 Sound Tr﻿ansit and the City of Shoreline are seeking residents' input. communicate concerns and approvals. Change will happen whether you get involved or not; support the change you can live with. room 301, and are shown on the Calendar. What might light rail look like? In 2018, Sound Transit will begin con﻿stru﻿ction of the Lynnwood LINK Light Rail Extension and a station at 185th Street and I-5. While five years seems like a long time, the permitting process has already started and soon many of the decisions regarding the development plan around the stations and the surrounding streets will be made. Now is our best chance to capitalize on a multi-billion dollar investment in our community. on all local streets, especially on NE 185th Street and 5th Avenue NE. As has been seen in South Seattle, the character of the surrounding area will likely change with transit oriented development (TOD). Within the ¼ mile walking distance, there will likely be a push to redevelop existing properties into dense, often multi-story residential and commercial mixed use developments.